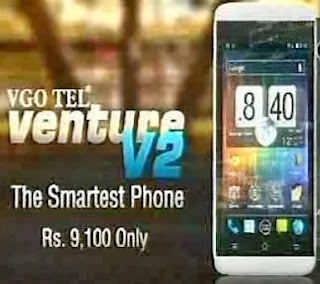 VGO TEL Venture V2 second Android smart-phone added in Venture series first was Venture V1. This Venture V2 have the 5 mega-pixel camera with flash led, 4 inches big screen, wifi, Dual SIM, 512 MB RAM, 1.2 GHz Dual core Processor. You can easily use Facebook, watching on-line videos, Talk with friends on Skype comes with many other features.